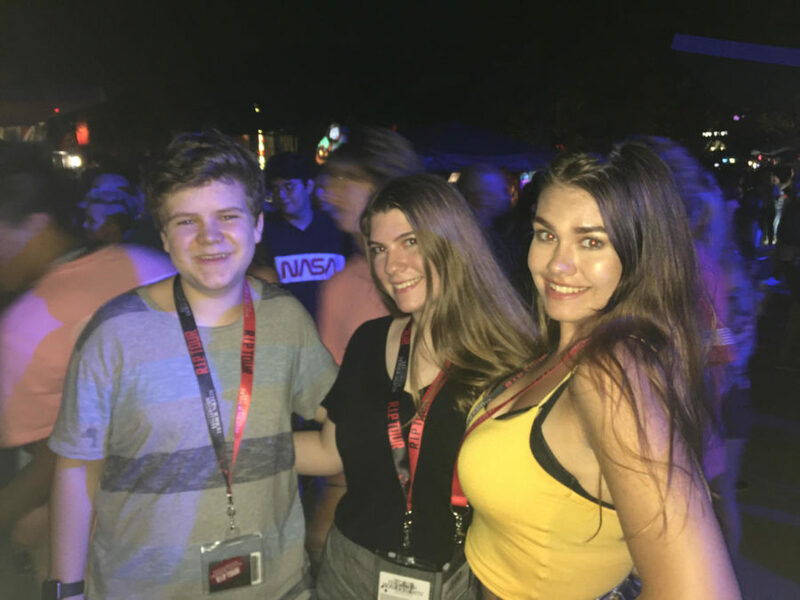 On Friday, Sept. 28 junior Jacob Shoemate, senior Bridget Froemming, and Jordan Bloom took the Halloween Horror Nights R.I.P Tour. The tour provided an exclusive tour through Halloween Horror Nights, including fast admission to the houses, free food, and premiere seating at the shows. Annually, Universal Studios Orlando hosts Halloween Horror Nights (HHN). HHN is a scary event featuring haunted mazes and scare zones based off original concepts and themes. This year, ten haunted houses and five scare zones have taken over the streets of Universal Studios in order to provide an immersive and scary experience to those who attend. I have been attending this event since 2014, and I always look forward to going back. However, this year, instead of the normal experience of waiting in long lines, I decided to try something new, the Halloween Horror Nights R.I.P Tour which is a V.I.P tour through HHN. This tour costs 189 dollars per person, on top of the purchase of a HHN ticket, and includes very lavish experiences. With a group of seven friends and family members, we tackled the R.I.P Tour on Sept. 28. The tour started off with a registration in the V.I.P lounge, where we received free lanyards and drinks. Once there, we met our tour guide for the night, Adam. After a few minutes of waiting for our group to meet up, we were escorted to Cafe La Bamba for a free buffet of horror themed dinner and deserts. Once in the cafe, I was overwhelmed by a million different scents and sights. The food there was delightful and extravagant, which made me feel like an actual V.I.P. During the delicious dinner, we were joined by scare actors from the Killer Klowns from Outer Space scare zone, which made the dinner frightening, but still amazing nonetheless. After a mandatory bathroom break, we were escorted by Adam to the first haunted house. The best thing about the R.I.P tour was the fact that we could skip the regular and express line and go right to the entrance of the house. We unintentionally scheduled our tour for the busiest night on record, so it was very convenient to skip the three hour wait lines for each house. On top of the private escorts to the houses, Adam would tell us the complete backstory of each house before we entered, so we could understand what we were walking into. After we went through all ten houses, we got premiere seating at the dance show, Academy of Villains. The show featured incredible dancers who had extreme talent while doing flips, slackline performances and contortions, so it was very enjoyable to watch. After the show, we went back to the haunted houses and did all ten again. Then, we all went to the HHN store, and got free t-shirts, jackets, and posters that would otherwise cost us hundreds of dollars. All in all, the Halloween Horror Nights R.I.P tour was an amazing experience that made us feel like celebrities. I would recommend this tour to anyone who is looking for a fun HHN experience.